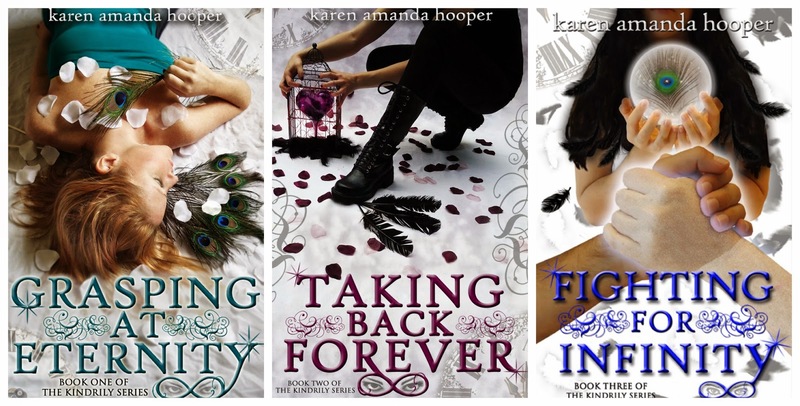 FIGHTING FOR INFINITY, the 3rd and final book in The Kindrily series by Karen Amanda Hooper, has been released! Every moment, every lifetime, every decision—including her choice to erase—has led Maryah to this.Two outcomes are possible: an infinite happy-ever-after with her kindrily or the final severing of her relationship with Nathan.Closer to the enemy than ever before, Maryah unravels the diabolical plan that Dedrick has been manipulating into place for centuries. Revelations, secrets, and lies surface faster than Maryah can process. 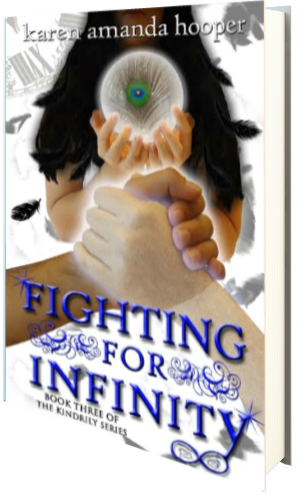 She doesn’t know who to trust, what to believe, or how to save her loved ones from the desolate future Dedrick is so close to executing.Guided by an enigmatic raven-haired prisoner, Maryah fights body and soul to save Nathan, her kindrily, and countless others. But is her love strong enough to alter a prophecy written in the stars? I absolutely believe in soulmates. I’m married to mine. It’s one of the reasons I’m so eager to read this series!